Chemical analysis of elephant hair can provide clues about the animal's diet and behaviour, say scientists. Researchers studied wild elephants in Kenya's Samburu National Reserve by tracking the animals with GPS devices and analysing their tail hair. One elephant had turned to eating crops, a major source of conflict between humans and elephants. The study is published online in the journal Proceedings of the National Academy of Sciences (PNAS). It is aimed at helping conservationists decide where to site sanctuaries. Conflict between humans and elephants becomes inevitable, as the human population rises. As elephants are squeezed out of their natural habitat by human settlements, they fall short of food and may take to raiding crops to supplement their diets. In rare cases, they may kill, or are themselves shot in retaliation. One big question is: how can we secure a future for elephants when we know that the areas set aside for their protection are too small? 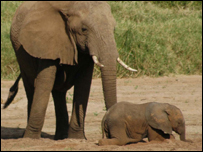 To find out more about elephants' movement patterns, scientists led by Thure Cerling of the University of Utah, US, fitted radio collars to wild elephants. They analysed their roaming habits over the course of two years and collected samples of tail hair. By studying the ratios of naturally occurring types, or isotopes, of carbon and nitrogen atoms, they were able to deduce the diet of seven of the elephants. All but one had a similar diet. The seventh, a bull elephant named Lewis, showed a higher intake of grasses, suggesting it had raided nearby crop fields. The elephant appears to have eaten lowland grasses in a sanctuary during rainy times, then moved up into the mountains, where it dined on shrubs and trees by day, and cornfields by night. The elephant was shot after the study was completed, possibly by a farmer, says the international team, from the US, UK and Africa. "One big question is: how can we secure a future for elephants when we know that the areas set aside for their protection are too small?," said study co-author and zoologist Iain Douglas-Hamilton, founder of the Save the Elephants Foundation in Nairobi, Kenya. "Tracking an elephant's diet through stable isotopes defines essential elephant dietary needs and can help inform land-use planning," he added. "The fine information from the isotopes and actual elephant tracking can help us define the critical minimum space needed by elephants and other animals."